The simple, elegant style of the Silvelox Flat Garage Door can be adapted to suit both contemporary and traditional homes. The vertical grain of the hardwood can be finished with a clear wood stain. 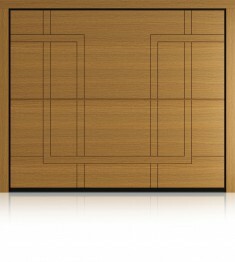 This will blend with a traditional style house or the door can be lacquered with a colour to give a more modern look. The leaf of this up and over garage door is 80mm thick. 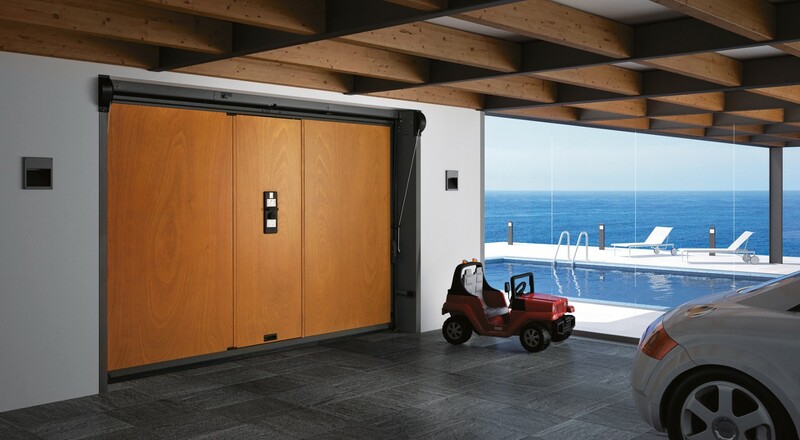 The outer surface of the Silvelox Flat garage door is a multi layered engineered board of okoume hardwood marine ply. This board is used extensively for nautical applications because it has been found to be durable in any climatic conditions. A galvanised steel internal frame gives the Silvelox Flat garage door leaf strength and stability. On the inside is also okoume engineered board and can be finished with various products; all eco-friendly. 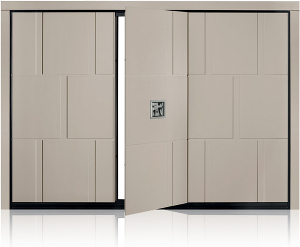 The door leaf is filled with a honeycomb which provides great thermal and noise insulation. The perimeter seals between the door and frame are EPDM rubber. These not only stop draughts but give finger trap protection. Similarly; the large rubber seal on the bottom of the door leaf gives a good seal and soft contact with anything that may get in the way. This door is unique in the way that it opens both manually and automatically. The Silvelox Flat garage door, like all the other Silvelox up and over garage doors, also has a patent on the lifting gear. This system, is easy to operate. This is because it opens and closes using a hidden system of cables, pulleys, and weights. The frame is galvanised steel with a lacquered grey paint finish. If fitted, an electric operator is hidden within the frame crossbar. The operator has no track. The door leaf protrudes to the outside slightly when opening and open. A different system can be specified if this is not wanted. Possibly where the door opens directly onto a pavement or the opening is arched. 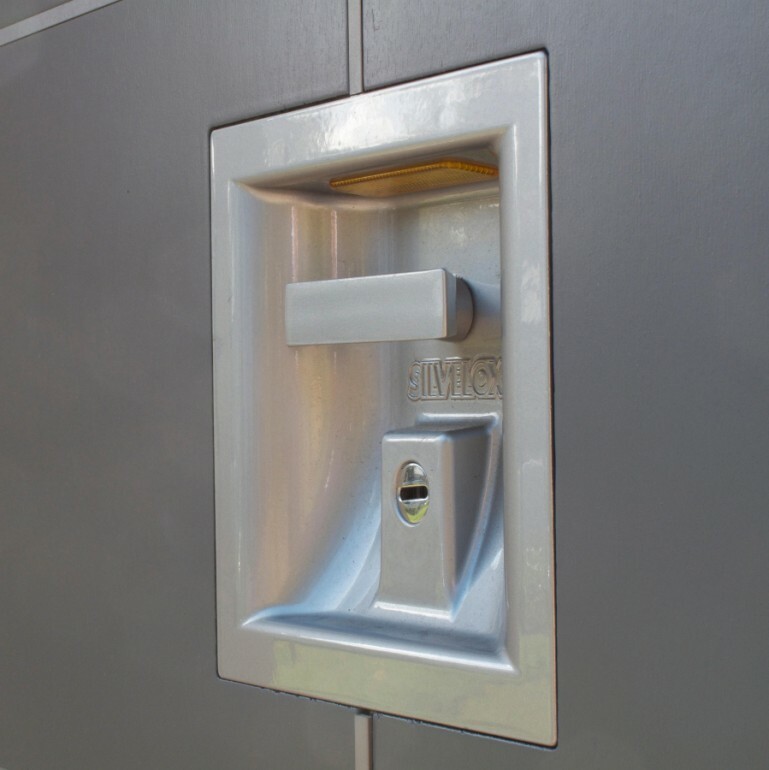 Security of the Silvelox Flat Garage Door. The standard Silvelox Flat garage door is very secure, however; an optional upgrade to class 1 or class 3 security is available. Class 3 security will prevent a break-in by a burglar armed with hand tools such as screwdrivers and a crowbar. The Silvelox W concept allows integration of several Silvelox products with a bespoke design service. There is also a Silvelox Flat front door with facias, glazing and side elements that can be incorporated into the building. 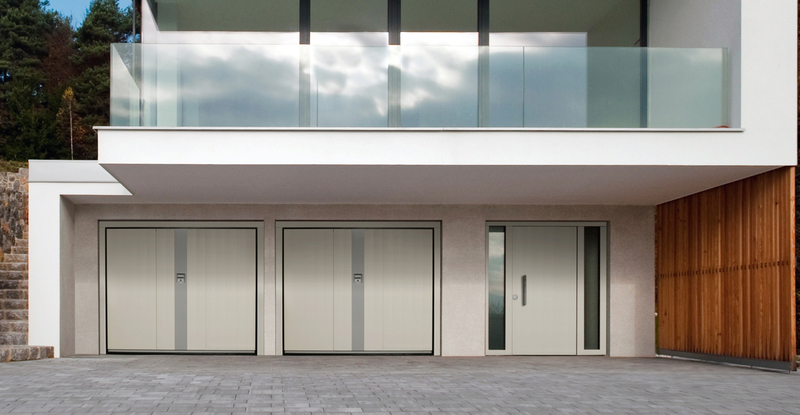 Lakes Garage Doors are proud to be distributors of Silvelox products. We recently visited the Silvelox factory in Italy and were hugely impressed. We have Silvelox products on display at our Lancashire showroom that we would enjoy demonstrating for you.